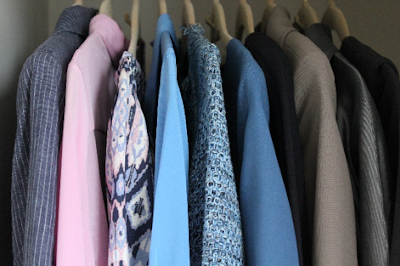 As well as updating your professional knowledge and networks to prepare for your return to work, think about spending a bit of time organising and updating your work wardrobe. Feeling good in what you're wearing can help to boost your confidence and to shift your identity back to your professional self. If you've had a very long career break, workwear/styles may well have moved on and we sometimes change shape too! Consider the culture of the organisation/industry you will be, or hope to be, working in. How formal/informal is it? What type of clothes would be most appropriate? Dress codes may have changed since you left - many sectors are less formal now - so do some research to update your knowledge. Think about how you want to be perceived and choose a few key words to sum this up, eg professional, competent, approachable. Take all your potential work clothes and shoes out of your wardrobe. If you have a rail you can use/borrow, even better. Select all the clothes that meet the first 2 criteria. Try them on to check they still fit you well and that you feel good in them. If not, sort them into piles for giving away, altering or storing. Group the remaining clothes into potential outfits. Make a note of any gaps, eg shoes, tops, and what colour would be a good match. Turn this into your shopping list and prioritise what’s most important. If you have space to store some of your clothes, such as under the bed or in a spare wardrobe, put away anything that’s not suitable for the current season. The fewer items you have to choose from, the quicker the process! I’m not a fan of selfies, but this is the exception: take photos of whole outfits (preferably with you in them) so that you can either print out a sheet of outfits or flick through your phone the night before work or an interview for inspiration and time-saving. Colour: try to avoid falling into the ‘black trap’. Black really only suits people who have ‘deep, cool and bright’ colouring, otherwise, it can be very draining, especially close to the face. Grey, for example, is a good alternative, there are many shades to suit different people and, when it comes to more expensive items like coats or bags, it will go well with many other colours. Materials: I have a personal preference for natural fibres and avoid anything made from fabrics like polyester. Although these fabrics are often cheaper and wash easily, they can cling and feel unpleasant when it’s warm. Also, if you’re heading towards, or already in, hot flush territory, synthetic fabrics are not your friend! You might also want to avoid structured dresses with sleeves which you will feel trapped in during a hot flush unlike a jacket/top where you can quickly remove a layer if you need to. For those of you who are fortunate enough not to have reached, or been affected by, this stage, enjoy the freedom of choice! Any good department store will cater well for different shapes, styles and budgets. For more formal/reasonable quality workwear, look at these high street brands: Cos, Hobbs, Jigsaw, Massimo Dutti, Zara, Reiss, Gerard Darel, Jaeger, M&S, Boss. A few good smaller brands, mostly online, are The Fold, Pinstripe and Pearls, Libby London and Rose & Willard. For less formal/more contemporary workwear, consider Whistles, Top Shop, Finery, Baujken, Me+Em, Uterque, Joseph. For shoes, try websites such as Zalando or Sarenza. If you’re on a tight budget, keep an eye on the sales (you can set Sale Alerts for items if you use websites such as Shop Style), look at shops such as H&M and Uniqlo and browse the charity shops in upmarket areas. If you are from a low income household, you may be able to get a referral to the charity SmartWorks which provides free interview clothing. Prioritising: Good quality workwear is usually quite pricey but I encourage you, if possible, to buy fewer, better quality items to get a good ‘cost per wear’ ratio. Buy the key items (dresses, skirts, trousers, jackets, suits) in fairly neutral tones (eg black, grey, blue, taupe, burgundy), so you can easily change the look with more affordable tops, accessories and different colours. For inspiration on reducing the amount of clothes we tend to own, have a look at this TEDx Talk by Jennifer L Scott. Help! If the thought of refreshing your wardrobe for work feels daunting ask for help from a friend whose advice you trust and style you admire, or take advantage of the ‘Image and Impact’ coaching session we offer at Women Returners. For more ideas about what to wear for work, have a look at this earlier blog post: What to wear to interviews. Posted by Natalie Hunter, one of the Women Returners Coaching Team and a trained Colour/Style Consultant. She offers these services separately, or together, for clients. Please contact coach@womenreturners.com if you’d like to find out more.